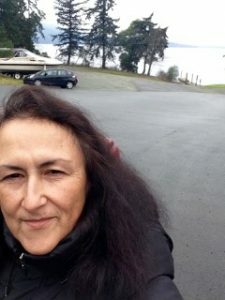 Sandy Scofield is a Métis (of Saulteaux and Cree descent) artist and composer based in Vancouver. She is a multiple-award winner having fronted many bands in her day – from rockabilly, cajun and zydeco bands to highly accomplished folk-rock, jazz and vocal ensembles. She has received three consecutive Juno nominations amongst her four releases to date. She holds an undergrad degree in music from SFU studying composition with new music composers Owen Underhill and Martin Gotfrit, electroacoustic music with pioneer Barry Truax and Indonesian Gamelan with Sutrisno Hartna. Since graduating, Sandy has composed music and created sound design for many theatre, dance projects and community theatre. Sandy’s music career has rewarded her with the respect and recognition from both her music peers and the public alike across Canada; internationally, she has performed on five continents. Sandy is constantly reinventing her relationship with various genres of music. Her group the Iskwew Singers are well-known at festivals and special events around the world. They have a three-week tour coming up early 2017 in B.C., and their second release should be out winter of 2017. They will tour Canada summer 2017 as part of Drum Canada.